Promoter Frank Warren has said that Carl Frampton will fight again in Belfast on Saturday 7 April. Former four-weight world champion Nonito Donaire is being tipped as one possible opponent for the Belfast man, with the SSE Arena the likely venue. Featherweight Frampton won on points in his comeback fight against Horacio Garcia on 18 November after being out of the ring for 10 months. 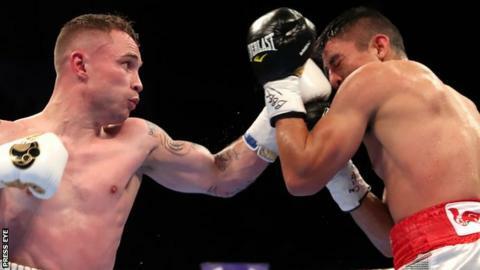 Frampton, 30, hopes to challenge for a world belt at Windsor Park next summer. The former two-weight world champion lost his WBA world title to Leo Santa Cruz in Las Vegas at the end of January and then split with Barry McGuigan's Cyclone Promotions management company in the summer. Warren indicated the date for Frampton's next fight in an interview with 'Behind the Gloves'. With IBF featherweight Lee Selby poised to defend his title against Josh Warrington, another victory would provide Frampton with the perfect platform to put himself in the mix for a title shot against the winner of that contest. While an opponent has still to be confirmed, Donaire would provide stiff opposition as he has held seven world titles by the four main boxing bodies in a career that has lasted 17 years.